(4 p.m. GMT) -- Fred. 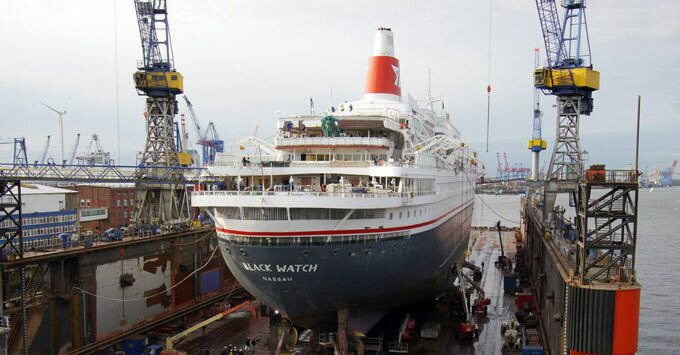 Olsen Cruise Lines' Black Watch will emerge from a 26-day dry dock refit at the Blohm + Voss shipyard in Hamburg next week with a host of sparkling new features. The refurbishment will see Fred. Olsen create more public spaces and refresh all cabins, restaurants, bars and lounges, while promising to retain the ship's intimate and traditional style. Here's what you need to know about the ship's refit. The ship's 423 cabins are a focus area of the refurbishment work, with the line instating new interactive TV systems; bathrooms will be updated throughout and safes and minibars will become a standard feature. The ship's buffet restaurant, Braemar Garden Cafe, is being replaced with a brand-new restaurant called Brigadoon -- a reference to Fred. Olsen's Scottish connections. The new buffet restaurant will seat up to 54 passengers and feature new decor, serving a mix of British and international dishes. The new Braemar Courtyard will replace the existing Black Watch Room to create a specialty dining space seating up to 46 passengers. Passengers will be offered an a la carte menu with a focus on steaks and seafood, with a brand-new galley kitchen installed to service the restaurant. The Glentanar -- the ship's 340-seat main dining room -- will receive an extensive makeover, with a new layout, fresh furnishings, carpets and curtains; while the aptly-renamed Poolside replaces the ship's existing Grill restaurant, located by the main pool, serving a new Mediterranean-style menu. All of the ship's lounge areas and bars will receive an update. The Morning Light Pub -- a fleetwide feature -- is moving to the former Braemar Lounge on Deck 6. The more spacious pub will benefit from new furniture and upholstery, and a new bar. This makes way for the brand-new Neptune Bar, which will be introduced in the former Morning Light Pub space. The Lido Bar will also benefit from new furniture, upholstery and carpets throughout, while The Observatory will receive new decor and fittings. The ship's Marina Cinema will receive a complete update, with the latest 3D technology installed, complemented by a programme of high-definition films and 3D movies. Managing director of Fred. Olsen Cruise Lines, Mike Rodwell, said: "Black Watch is one of Fred. Olsen’s most popular cruise ships, and it is important that she always looks her best. During her 26-day dry dock in Hamburg, as well as the usual maritime inspections and maintenance work, we will also be undertaking major upgrades to the cabins and public areas throughout the ship, to ensure that we continue to provide the best facilities possible to meet our guests’ expectations. "Our significant investment in refurbishing and upgrading Black Watch will ensure that our guests will be able to enjoy her classic looks and unique, intimate ambience for many years to come." The cruise line has also confirmed that similar upgrades will roll out fleetwide -- on Balmoral, Braemar and Boudicca -- in the coming years. It's been an eventful year for the 44-year-old Black Watch after an engine room fire broke out while the ship was docked in Madeira in July, forcing a cruise to be cut short, passengers flown home early and the ship sent in for repairs. Damage was limited to the engine room, however, and although Black Watch's following cruise was cancelled, the ship was back in action to complete a 26-night Arctic cruise on July 17. Black Watch will set sail on its first post-refit voyage from London Tilbury on a seven-night German & Danish Christmas Markets cruise on December 15, 2016.